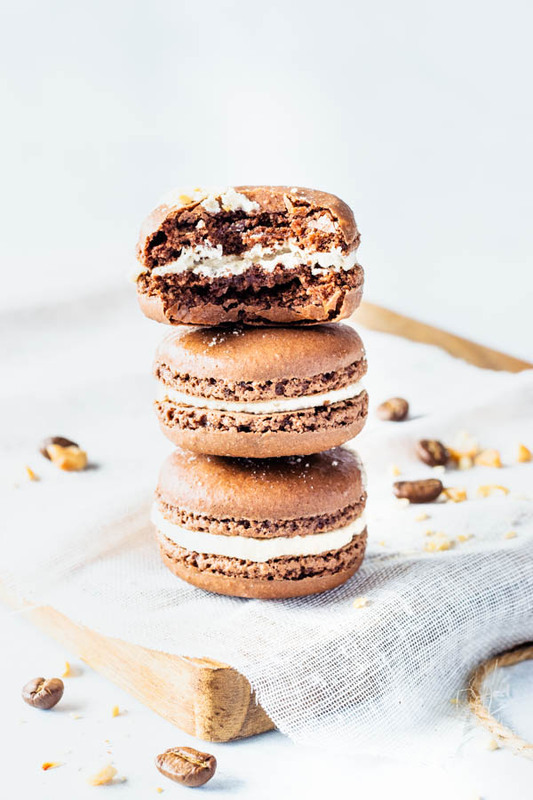 Espresso Chocolate and Peanut Butter Macarons. I made these macarons because I wanted to top my Espresso Chocolate and Peanut Butter Cupcakes with something pretty and fancy. I think this might just be one of my favorite flavors!! Espresso Chocolate and Peanut Butter Macarons have really stolen my heart. 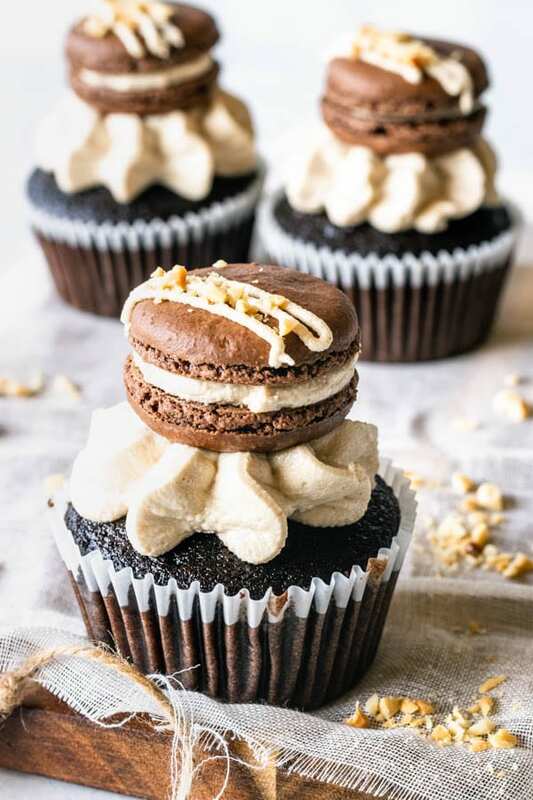 If you plan on making these together with the cupcakes, I advise just making the Peanut Butter Cream Cheese frosting listed in the recipe for the cupcakes. The amount of Peanut Butter Cream Cheese Frosting in the macarons recipe will be too small, and probably just enough to fill the macarons. Making macarons can be really tricky. You might not get it right the first time (or second, or third). I have had tones of success, and also tones of failure when it comes to making macarons. 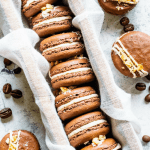 How to make perfect macarons every time? I still have a batch or two that go wrong every now and then, and that’s because I will have over mixed the batter or forgot to rotate my macarons in my oven, or something. So, mistakes might always happen. However, you can learn along the way and get better and better as you go. 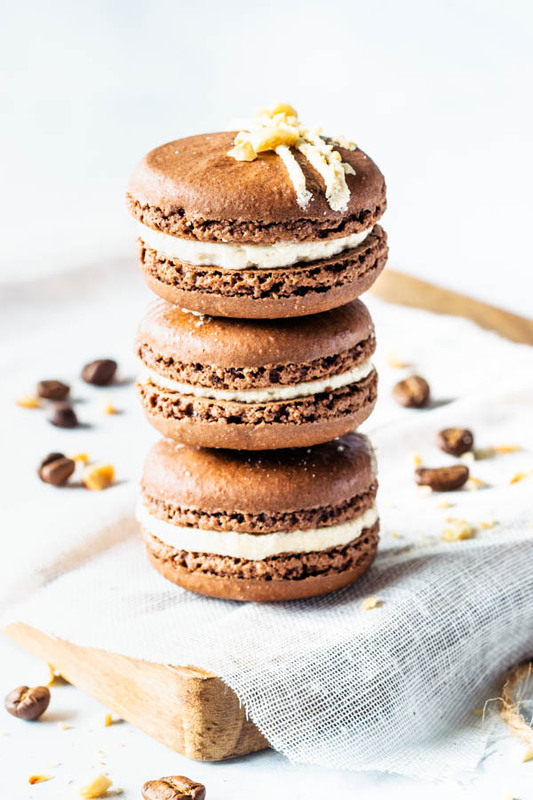 With these Espresso Chocolate and Peanut Butter Macarons, the first time I made them, I added too much cocoa powder to the recipe, making the batter too dry. The final product was fine, and edible, but too dense for my taste. I like my macaron shells to be the most delicate they can be, and dense doesn’t go with delicate. Anyway, there are tones of tips on the internet on how to make perfect macarons. I suggest you take a look at them and by practicing, choose what suits you best. I also recommend reading my Matcha Macarons post, because I cover a lot of tips there. Are macarons really that hard to make? The answer is yes and no. They can be very tricky. 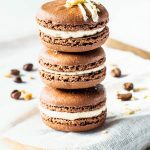 However, with practice, you start to learn what the macaron batter is supposed to look like, so you know how to fix any issues, or how to stop mixing when it’s time, or keep mixing if it’s required. Do I have to age my eggs to make macarons? Some people will tell you to age your egg whites for a while before making the macarons. I have done that several times, to try out. And honestly, I have seen absolutely no difference in my macarons. So I don’t waste my time anymore. What method is best for making macarons? In my Matcha Macarons post I talk about all the methods with a bit more details. There are three different methods: French, Italian, Swiss. I have tried every single one of them, and the one that suits me best is the Swiss method by far. I have used the French quite a bit in the past. But I find it to be too unstable and it gives me more issues than the Swiss method. When to stop mixing macaron batter? The macaronage is what we call when you fold the dry powdered sugar and almond flour mixture with the meringue. And along with baking method, this is the most important step in making perfect macarons. You have to fold this mixture just enough. Not too much, and not too little. You will usually find in websites talking about the “molten lava consistency”. However, that is not a very helpful description in my opinion, because there’s a big range where your batter will resemble molten lava, but still won’t be ready for piping. -Start folding the dry ingredients into the meringue, in a motion where you are forming a letter J with your spatula. -Fold until all ingredients have been incorporated. Batter will seem grainy and thick. -Keep folding about 10 more times. -Now you batter will probably start looking like the molten lava they talk about. -When you lift your spatula, batter should fall from it without breaking apart. If it immediately breaks apart as you pull your spatula up, then keep folding a bit longer. -The idea here is that you’re supposed to be able to form several figures 8 with your spatula before the batter breaks. -Now you may start testing it out. Grab a small teaspoon and spoon some filling onto the baking sheet lined with the parchment paper you’ll be using later. Give it a few seconds. If the batter you spooned on the tray doesn’t move at all, and doesn’t start spreading out a little bit, then you have to keep stirring, probably just once or twice at a time, until you test it again. -So, what you are looking for here is: spoon the batter on the baking sheet, the top will become smooth, without any pointy tips sticking up, it will be glossy and shiny. -Now, also be careful not to over stir at this point. Always be sure to test several times before you stir away. Be very careful about stirring. If you over mix, the batter will be too thin and will spread in the baking sheet, losing its shape. What is the best temperature to bake macarons? The best temperature to bake macarons for me is 325F. But PLEASE be aware that every oven is SO different. and baking time and method can MAKE or BREAK your macarons! You need to know what your oven is all about. For instance, in my previous oven, I could bake two trays of macarons at the same time, and just rotate them. With my current oven, if I do that, the macarons in the bottom of the oven will have cracked shells and no feet, because there’s too much heat in the bottom of my oven. So, for me, I have to place a rack in the middle of my oven, bake one tray of macarons at a time, rotating the pan 180 degrees halfway. You should probably have a thermometer in your oven (or 2 if you are me) to help regulate the temperature. Experiment with your oven, and just be ok with having a couple of batches that are going to go wrong eventually, because that’s what making macaron is all about. How do you know when macarons are done baking? Macarons are done baking when they have developed feet, and the color has deepened slightly. For me it takes about 12 minutes usually. I hope you liked my tips for today. Also remember to check my Matcha Macarons post for some more tips. My hot Macaron recipes at the moment are: Blueberry Macarons, Salted Caramel Macarons, and Lemon Macarons. Espresso Chocolate shells, filled with creamy Peanut Butter Cream Cheese frosting. Sift powdered sugar, almond flour, cocoa powder, and espresso powder together. Set aside. Pipe a small amount of filling on the flat side of a macaron shell. Place another shell on top. I used a number 3 round tip to pipe some of the Peanut Butter frosting on top of the assembled macaron sandwiches. I also sprinkled some crunched peanuts on top. Store in the fridge for up to 4 days. Store in the freezer for up to 2 months. You can freeze macarons assembled, or just the shells. Entirely up to you. Leftover frosting can be stored in the fridge for up to 4 days, or in the freezer for up to 2 months. First section of the recipe calls for 3/4 cup of???? I love macarons! Can’t wait to try this once the recipe is updated! Hey there! Thanks for pointing out!! The 3/4 cup is the measurement for the powdered sugar that was listed on the line above!! Thank you so much!! I’ve fixed it, should be good now!! 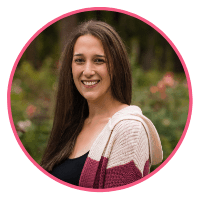 Have a great day, Dori!! 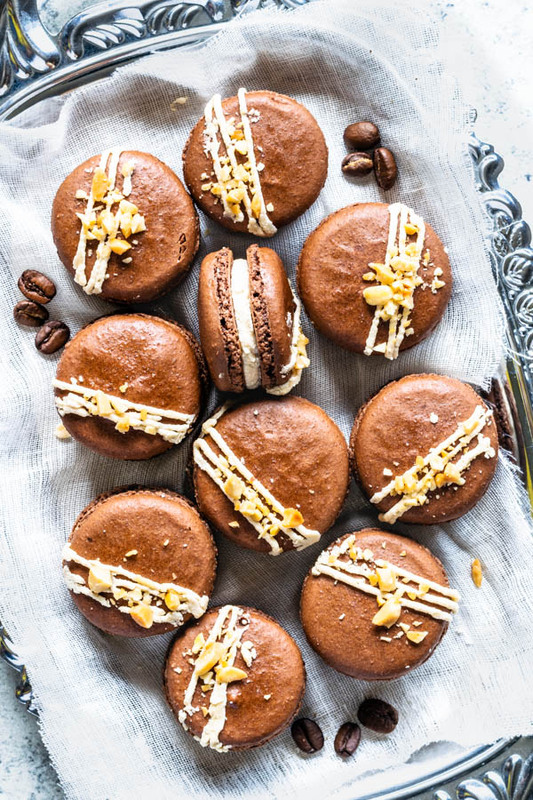 I love macarons so much and these look amazing – I love the flavours too, so tasty! I love macarons but have never tried making them myself. These would definitely be perfect as a holiday gift or something – I totally need to give it a shot! This dish looks absolutely delicious and your photography is gorgeous. 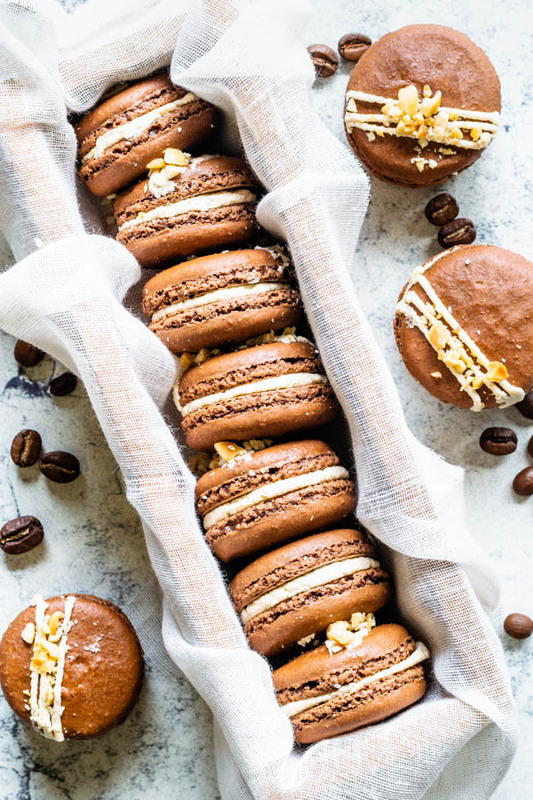 These macaroons will be added to our next sweet treat recipe list. Is there a better combo than coffee, chocolate and peanut butter?!?! These look AMAZING. Your tips for macarons are great too!